If you walk past the Henllys golf course and out of the main drive, nestled down in the valley before you is the impressive Beaumaris Castle. It's just a 20 minute walk from the site and the town itself is full of cafés and eateries for you to enjoy a post-walk cuppa. Beaumaris is right on the east coast of the Isle of Anglesey; perfectly placed to overlook the Menai Strait. It started out as a Viking settlement, attractive due to its position from the sea, but it was not until the late 13th century that the town started to develop. This was under the direction of Edward I of England who, having conquered Wales, commissioned the building of Beaumaris Castle. Built on a marsh, the Castle's name derives from its description by the French builders: Beaux Marais which translates to 'beautiful Marshes'. Why was it never completed? Various cost restraints halted the building of the castle through the late 13th and early 14th centuries, and by 1330 construction had unfortunately stopped. The walls were only a fraction of their intended height. However, thanks to its strategic position, it was still utilised during various disputes and sieges. Having survived the Civil War of the 17th century the castle fell into the care of the Bulkeley family for several centuries. Though never fully completed, the castle was and is still regarded very highly and makes for a wonderful sight more than 700 years later. In the early 20th century Richard Williams-Bulkeley gave the castle to the Commissioners of Works who carried out large restorations. 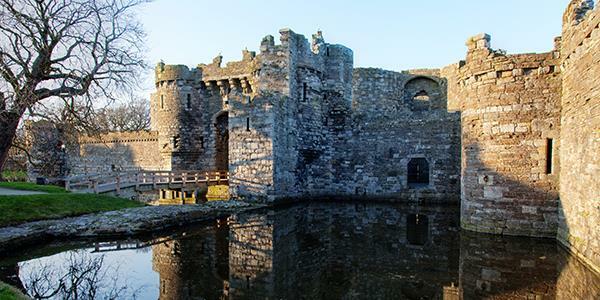 Beaumaris was one of the last Edwardian castles to ever be built and has been considered by UNESCO as one of the finest examples of 13th/14th century military architecture in Europe. The reason Beaumaris Castle is so admired is its beautifully crafted symmetrical, concentric design. It boasts four successive lines of fortifications in its 'walls within walls' structure. So well-designed was the castle that, had it ever been finished, it would have stood firmly at the forefront of military architecture back in the 1300s. This concentric castle had both an outer and inner wall that were studded with towers. The inner ward would have been designed to hold accommodation and inside the towers and the great gatehouses at either end of the courtyard is where the luxury royal accommodation would have been. The castle has been designated as part of a World Heritage Site and is open most of the year for visitors. The extensive ruins include loads of nooks and crannies to explore, and the walkways and battlements offer great views of Snowdonia. There is an admission charge which is £6.00 for adults and the opening hours do change depending on the season, so do check the website before setting off. There is also a series of events and activities throughout the year. Find out how to stay at Henllys on the Isle of Anglesey for yourself. To receive your free brochure enter your details at the bottom of the page.